Duchess Meghan of Sussex made her debut Tuesday at Royal Ascot, a series of horse races equivalent to the Kentucky Derby, only longer and with even wackier hats. But while the Derby has plenty of froufrou dresses and chapeaux, what it doesn't have is Queen Elizabeth II and the royal family parading by in carriages at the historic racecourse located about an hour's drive west of London. And where sister-in-law Duchess Kate of Cambridge has continued to wear outfits from her wedding dress designer, Sarah Burton of Alexander McQueen, Meghan is showing continued allegiance to hers: She wore her third white Givenchy ensemble by Clare Waight Keller — this time a long-sleeved shirtdress with embroidery, belt and handkerchief hemline. She paired her summery frock with a black-and-white hat from Philip Treacy, the preferred milliner of British high society. Her black clutch with jeweled clasp was also said to be from Givenchy. Meghan, 36, wasn't the only Royal Ascot newbie; Sophie, Countess of Wessex, wife of the queen's youngest son, Prince Edward the Earl of Wessex, also made her debut. The two couples rode in the same carriage during the parade, according to video posted by the racecourse. 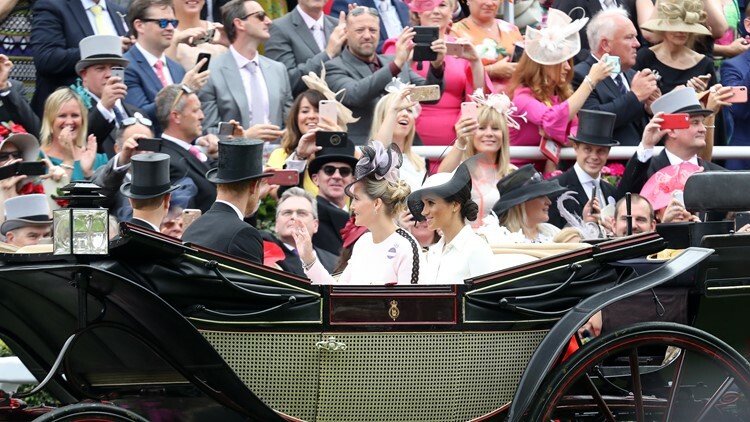 Prince Edward, Earl of Wessex, Prince Harry, Duke of Sussex, Sophie, Countess of Wessex and Meghan, Duchess of Sussex arrive by carriage to Royal Ascot Day 1 at Ascot Racecourse on June 19, 2018 in Ascot, United Kingdom. Royal Ascot is Britain's most famous horse-racing meet, a 300-year-old royal tradition beloved by the queen, 92, and the rest of her horse-loving family. Hats are a must at Royal Ascot, according to the dress code, although female racegoers have embraced increasingly more outlandish headgear in recent years. 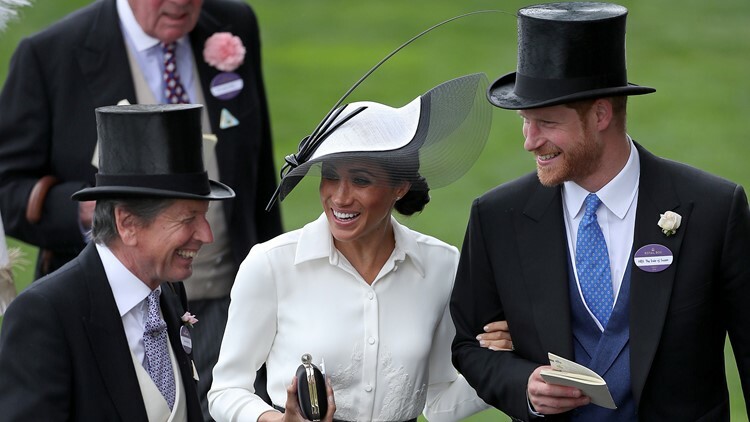 Britain&#39;s Prince Harry, Duke of Sussex, and his wife Britain&#39;s Meghan, Duchess of Sussex react as they talk with the Queen&#39;s Bloodstock and Racing Advisor, John Warren on day one of the Royal Ascot horse racing meet. Daniel LEAL-OLIVAS / AFP, This content is subject to copyright. On the first day of the five-day event, attending royals, led by the queen, make their entrance in multiple open carriages starting at 2 p.m. local time. This year, the queen stood out as usual in a canary yellow ensemble, with a yellow topper adorned with a huge baby-blue flower. She rode in her carriage with her daughter, Princess Anne the Princess Royal, whose own daughter, Zara Phillips Tindall, gave birth Monday to her second baby girl. That makes Anne a grandmother for the fourth time, and the queen a great-grandmother for the seventh time.